Mega Fortune is an online slot machine completely focused on the finer things in life; we’ve reviewed several slots in a similar vein recently such as The Finer Reels Of Life from Microgaming but this one’s from Net Entertainment and so we can expect something a little different. 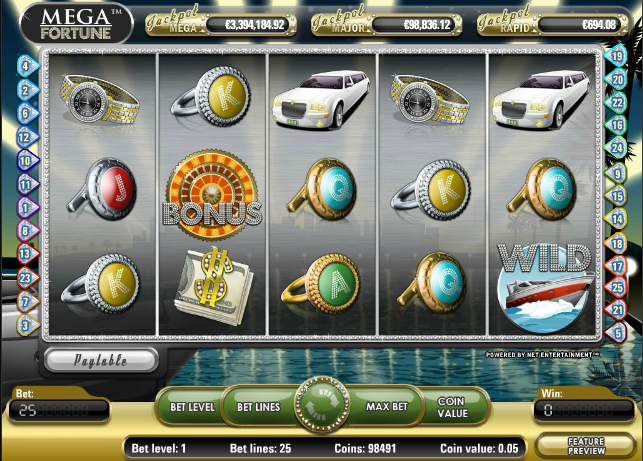 Mega Fortune features five reels and twenty five paylines and it’s a game which seems positively gold-plated; it exudes wealth and sophistication and the reels are set against a backdrop of yachts, fast cars and champagne. The lower value J, Q, K and A symbols are engraved onto coloured rings and the higher values are represented by a brandy/cigar combo, a money clip, a very expensive-looking watch and a stretch limousine. Special symbols include a Wheel of Fortune bonus, a speedboat wild and a scatter symbol featuring champagne and a couple of glasses. To play this potluck game you’ll need to land three or more of the bonus symbols from left to right on successive paylines; this will entitle you to a pop at the Wheel of Fortune which is also the key to the progressive jackpot. As you can see from the video below the outer wheel will spin and will either award you a cash prize or an arrow to the next inner wheel. Here you can win another cash prize, an onward arrow or the Rapid progressive jackpot. On the next inner wheel is an even bigger cash prize, the Major progressive jackpot or an arrow to the ultimate Mega progressive jackpot. Landing three or more of the champagne scatter symbols anywhere on the reels will win you entry into the free spins round. There’s nothing like the prospect of a possible progressive jackpot win to get the juices flowing and Mega Fortune seems to give you a good chance of winning; the bonus game is triggered pretty regularly and each time you play it there’s a chance of the jackpot win. Net Entertainment combines some great graphics with two enjoyable bonus games and a funky 1970s jazz soundtrack to form an eminently playable game; the possibility of a progressive jackpot win is the icing on the cake.